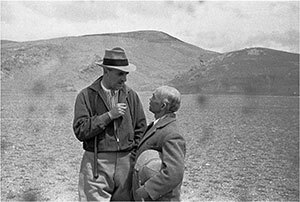 The similar nature of some of the images is demonstrated well by the photographs seen here of David Macdonald and Sir Basil Gould, the latter who was en route to Lhasa in 1936 as head of a British Diplomatic Mission, the former who was a long term resident in southern Tibet, close adviser of Sir Charles Bell and who worked as Trade Agent in Yatung and Gyantse at various points in his career. The bottom image was taken by Evan Nepean, one of the telegraph officers on the Mission. The top photograph was taken by Philip Neame who was Military Adviser to the Tibetan Government when in Lhasa briefly in August – September 1936 as part of the British Mission under Gould. These images were clearly taken on the same occasion, mere moments apart, and the Nepean image could appear on first sight to be merely a zoomed and cropped reproduction of the Neame image. 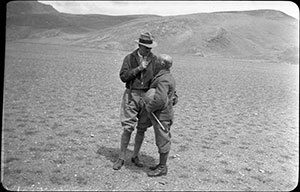 However, they reflect a very common feature of all the collections: the range of images taken was often quite limited given the constraints that operated upon official representatives in Lhasa and their assistants. Mission members frequently photographed the same people, places and festivals, often from the same location, sometimes only seconds and inches apart from each other. The difficulty arising when handling the historical material itself is that the sheer quantity of images being dealt with makes the visual retention of such fine distinctions by memory alone almost impossible, often leading to excessive checking and therefore handling of fragile and vulnerable historical materials. The digitisation process enables multiple images to be collated and studied without excessive handling by making the digital image a powerful mnemonic tool (e.g. : as a thumbnail in a database) and for many images to be analysed conjointly and in multiple contexts. How this was done will be discussed more fully below.